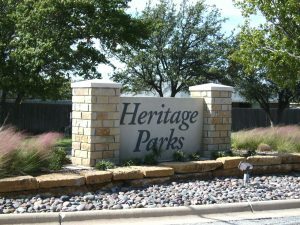 Heritage Parks is a community in northeast Abilene, Texas. This is an area of town that is experiencing much growth recently and, in turn, we continue to add new homes each month. We are conveniently located to shopping including Lowe’s and Wal-Mart and have many great restaurant options. Yet, even with these conveniences, we are still on the very edge of town and one small turn further northeast will reveal farmland and nearby wind farms. It’s the best of both worlds. This site is maintained as a project of our homeowners association in an attempt to inform our current and future residents of our goals and objectives. The main goal of our homeowners association is to enhance our neighborhood in order to improve the quality of life here as well as maintain optimum property values. Please take a minute to explore our site to see what we are all about! Find out more about Heritage Parks HOA and see if we can answer your questions in our Frequently Asked Questions section. Email association membership or management questions to the president. Email accounting/billing questions to billing.